Supplemental irrigation is required when effective rainfall and soil water storage in the crop root zone cannot supply the root system with enough water to meet crop evapotranspiration (ET) demand. Without irrigation, practicing poor irrigation management, and/or using an inefficient irrigation system, can result in crop water stress, which can lead to reductions in biomass, grain yield, and grain quality. Whereas excessive irrigation can result in runoff, deep percolation, soil erosion, and/or anaerobic soil conditions, which can drive up operational costs and lead to environmental degradation. With local and global concerns for future water availability and environmental and financial sustainability, greater attention has been focused on efficiently using water and energy in the agricultural sector. Enhancing irrigation efficiency will result in water and energy reduction input and improved crop water use efficiency. enhanced on a field scale may result in water conservation, but the impact on overall water balance of the watershed or a basin may not be affected to the same or similar magnitude as those on a field scale. Establish an irrigation efficiency “point-of-view” by outlining what metric on which the irrigation system will be evaluated, the objective or purpose of irrigating, and the time and spatial scale of interest. 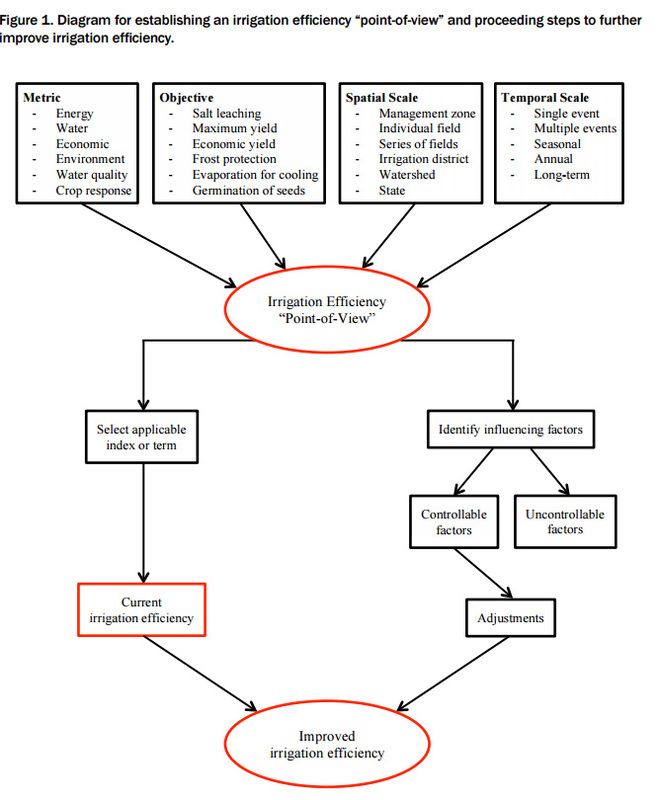 A flow diagram for establishing an irrigation efficiency “point-of-view” along with proceeding steps to evaluate and potentially improve irrigation efficiency is presented in Figure 1. Several terms or indices used to explain and/or quantify the efficiency of an irrigation system have resulted in confusion and often misrepresentation of a system’s performance. One can more readily select the correct terms or indices to quantify their existing efficiency by establishing an irrigation efficiency “point-of-view.” Several terms will be addressed in this series. One can identify controllable factors that can be adjusted to improve the performance of the system after evaluating the current efficiency of a system. Depending on the “point-of-view,” irrigation efficiency can be influenced by a number of factors, including pump efficiency, engine, irrigation system type and capacity, management practices, crop type and development, climate, soil physical and chemical properties, and fuel price, among others. These influencing factors can be divided into two categories: controllable and uncontrollable. Controllable factors can be adjusted or influenced by the producer to improve irrigation efficiency, and uncontrollable factors cannot be adjusted. 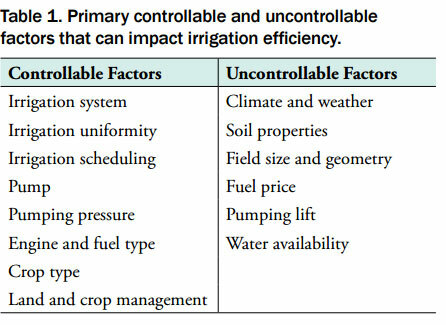 Table 1 lists various controllable and uncontrollable factors that can impact irrigation efficiency. Certain controllable factors are more easily modified than others, and in some cases adjusting factors to improve efficiency is not economical. We recommend consulting an irrigation equipment expert prior to major adjustments or upgrades.